Dr. Marion Blank has spent over forty years studying how children learn to read and is recognized by her peers as one of the world's top experts in literacy and language. In addition to being the co-founder and Chairperson of ASD Reading, she also serves on the faculty of Columbia University where she developed and ran the Light on Learning Program.Dr. Blank obtained her Ph.D. in Medical Psychology from the University of Cambridge in England. She then went to the Albert Einstein College of Medicine where she participated in a research unit on human behavioral development and directed the teaching program of the Interdisciplinary Training Program. Subsequently, she was a Professor in the Department of Psychiatry at Rutgers Medical School where she directed the research unit in reading disabilities. Among her many achievements, she has lectured extensively around the globe, served as a consultant to government bureaus in many different countries, received numerous awards and commendations, authored the widely used Preschool Language Assessment Instrument (PLAI), developed the award-winning and highly successful Sentence Master computer program that teaches reading, created the Phonics Plus Five Reading Program, and written over sixty articles and seven books on language and literacy. Her latest book is The Reading Remedy. 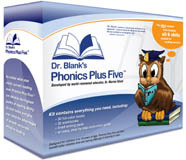 Described by Kirkus Reviews as "an invaluable resource," The Reading Remedy explains Dr. Blank's reading system in depth. In addition to her work at Columbia University, Dr. Blank operates a private practice in New York and New Jersey where she is a licensed psychologist. Additionally, she serves as a consultant to a wide range of school districts in the tri-state area of New York, New Jersey and Connecticut. Dr. Blank is a member and fellow of the American Psychological Association and a member of the Association of Children with Learning Disabilities. She has served on the editorial boards of a number of journals concerned with the issues of language and learning (e.g., Child Development, Applied PsychoLinguistics, Early Child Development and Care) as well as the boards of numerous committees including the William T. Grant Foundation and the National Institute of Child Health and Human Development. Dr. Blank has also made numerous television appearances, including ABC News, CBS News, FOX and the BBC. Dr. Blank has devoted her life to helping children learn to read, and she has used her innovative methods to help literally thousands of kids. Now, with her groundbreaking new reading program, ASD Reading, she is making her system available to every parent. Cambridge University, Cambridge, England, Ph.D.